All hell broke loose, resulting in a classic NCAA Tournament game finish, not in its outstanding, stellar or efficient play, rather in its all-fired tenacity, toughness and tightness. When the havoc cleared, the numbers on the board read: Auburn 78, New Mexico State 77. And that’s what makes the madness mad. Excellence, ineptitude, insanity, doesn’t matter. In the final second, the final 1.1 second, as the score indicates, either team had a chance to win. And that’s always a beautiful thing, even when it’s ugly getting there. In the final 20 seconds, after the Tigers had done, as Harper mentioned, more than their share of stumbling and bumbling, fiddling and faddling, missing shots, turning the ball over, fouling, it flowed forward like this … an NMSU 3-pointer cut the margin to one, a few Auburn free throws stretched the lead to four, another Aggie 3-pointer cut the difference to one with six seconds left. From there, an Auburn free throw made the margin two, next thing, New Mexico State passed up a layup to find Terrell Brown at the arc, who was fouled on his 3-point attempt, proceeding to miss two of three free throws, including the last one that was knocked out of bounds by a Tiger with 1.1 second left. A last ditch bomb from the left corner was missed by the Aggies, end of game, end of story. But, thing is, it’s not the end of the story. It is the story, the story of March, the exact component to the whole endeavor that makes it worthwhile, makes it what it is. Wacky, wholly unpredictable and wonderful. Here you had the Aggies from Las Cruces, the little WAC champions, against Auburn, which had just won the SEC tournament, coming in proud from a major conference, and, on Thursday, it made no difference what league these teams represented, what the tradition of their school was, who their alumni were, what was supposed to happen. All that mattered was what could happen and what did happen. 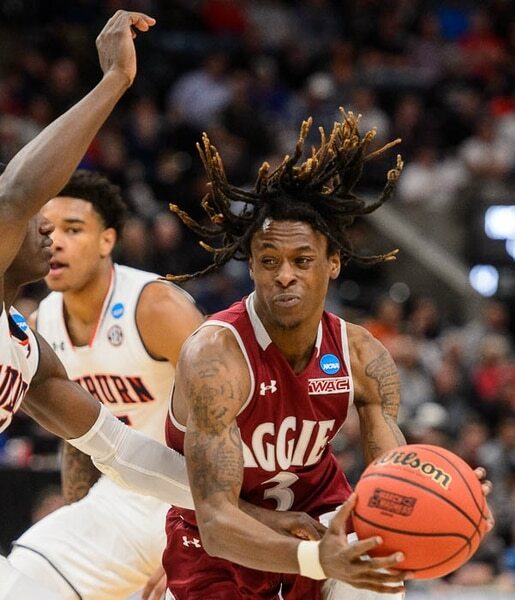 The Aggies were nobody’s slouch, having won 30 games heretofore, against what might have been considered inferior competition. Still, they were good and deep and could get scoring from many different spots on the floor. They could fly up and down the court, using, as has become their trademark, line shifts like a hockey team to keep their players and the action fresh. 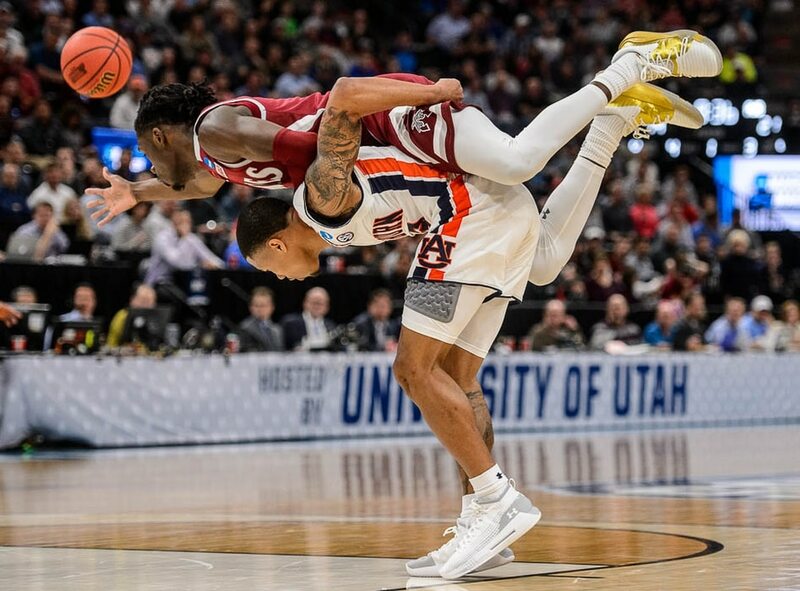 They had a collection of talent, castoffs from a number of bigger programs, that had assembled at New Mexico State to do some damage, to prepare for the tournament during the regular season, and, then, to utilize not only that talent, but the experience of dancing last season, learning from that. And maybe on any given day, they could. On this day, they could beat Tigers, but didn’t. Auburn, which had burned into the NCAAs by beating Tennessee in that SEC championship game, fell behind early, then built a nine-point lead, the lead whittled down and then grew from there. 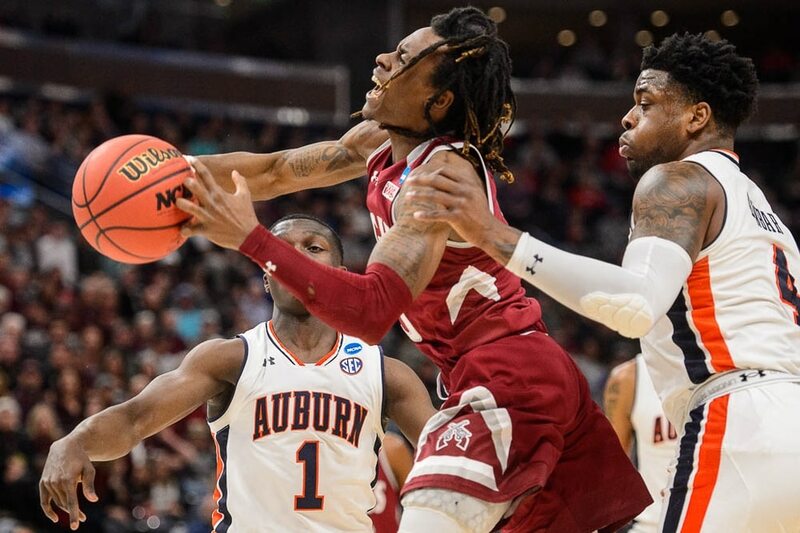 Ultimately, New Mexico State came charging back, over stretches matching Auburn’s considerable athleticism, hitting shots inside and out, to make it what it became. While the Aggies often liked to use their depth to speed games up and wear opponents out, Auburn also had that same preference. At times, New Mexico State had to throw the anchor overboard, attempting to slow the pace. It did work, it didn’t, and it did. Neither of these teams, based on the way they played, at least at times, would be candidates for All-MENSA consideration. Cerebral ball was not always employed, as a total of 26 turnovers and 43 fouls were committed between them. But, plainly put, that was part of the charm of the entire happening. It was raw, rugged ball, both teams popping 3-pointers and driving strong to the rim, pounding the boards and running hard. They played straight through adversity, with passion and with pride.